Curtis Duncan: Nestle: "Humans Have No Right to Water, Water Should be Privatized and Sold"
Nestle: "Humans Have No Right to Water, Water Should be Privatized and Sold"
According to Nestle and other proponents of water privatization and commodification, human beings have NO right to water. It should be privatized and sold which means if you lack the money to pay for safe water, you will just die which ten of thousands of people do every single day. This deadly "market" ideology is one of the reasons why thousands of residents in Flint lack safe, drinking water because they supposedly have no "right" to safe, drinking water. Ideologically speaking, bottled water companies essentially support denying people access to safe drinking water so they can sell more bottled water. Nestle, Coke, and Pepsi are currently making billions in profits from this water crisis through bottled water sales. America's water infrastructure is crumbling and its water supply is heavily polluted and this benefits the mega-banks like Goldman Sachs and bottled water companies who wish to privatize the world's water supply and make trillions from it. Banks already force 3rd world countries to sell their world supply once they get the countries in debt. Failing infrastructure and water pollution become two market-created problems which require fraudulent, market-driven solutions i.e. 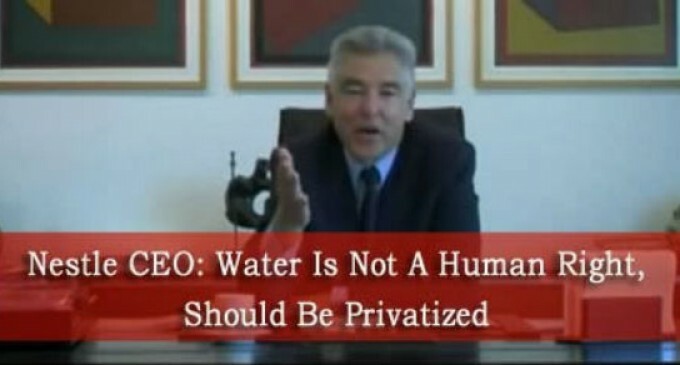 bottled water and water privatization. Of course, corporations are responsible for the failing water infrastructure since everything is built to break or fail in the country via planned obsolescence and many of the corporations, i.e. Nestle and Coke who push bottled water, are responsible for the tremendous pollution of the water supply today. Companies like Nestle are buying up the world's water supply in effort to make profits of the world's fresh water scarcity while simultaneously polluting the world's fresh water so they can sell bottled water in the first place. When these companies get their hands on the world's water, millions will die of thirst, wars will be fought over water, and fresh water will continue to be more scarce and polluted. The coming global water crisis and privatization of the water by banks and huge corporations is just another example of how kapitalism kills! Here are some excellent documentaries below to learn about the global water crisis, corporations' and banks' stealing of the world's water supply, the fraud of bottled water, the future wars which will be waged for water, water pollution, and cause of water scarcity.